It’s a gray afternoon on Feb. 7 and the windows of the U.S. Cellular Center in Asheville, North Carolina are decorated with large, human-sized tennis balls. Crows pick through the trash near a sign announcing the symphony, and someone has vomited coleslaw in the mulch near a satellite truck. It is one of the first days this year that I am able to smell the dirt itself, and the promise of spring makes the idea of tennis feel more salient. The Fed Cup is in town, and the U.S. team is preparing to square off against the Netherlands in the first round of the World Cup of women’s tennis. The Americans will go on to win later this weekend to advance to the second round, but those matches are days away. The last time I was in this arena I was covering a Trump rally, but today, I’m here to watch Serena Williams practice. I hold reverence for the art of discipline, and I believe that if you want to meet greatness where it lives, you must go to practice. So I grab a seat courtside next to a bevy of photographers and get ready. Venus Williams comes out before her sister, her long strides carrying her into the arena while Captain Kathy Rinaldi lobs balls to CoCo Vandeweghe. Venus is endlessly springy, light on her feet as she deftly wields her left arm as a counterbalance, like a cat with its tail. As she warms up, her silence gives way as each exertion becomes audible with a closed-mouth hmmm! It’s a light noise, almost breaking like a question, and it suits her movements well. While many tennis players ground themselves with wide, low stances, Venus bends over in a casual way, her knees more soft than angled. Her motions seem effortless, their results anything but. Serena is next. Four days from now will mark her first time on the court since winning the Australian Open during the early stages of her pregnancy. Childbirth and its after-effects nearly killed her, and yet, here she is, mother of a five-month-old, preparing her return to international competition. Her ordeal started with the emergency C-section that brought her child Alexis Olympia Ohanian Jr. into the world. After the scare that precipitated the surgery—her infant’s heart rate plummeting to precarity—it seemed all was fine. But, as she told Vogue Magazine, things quickly took a turn for the worse. The day after the birth, Serena became short of breath. She’d had a pulmonary embolism before, and she knew the symptoms. She was also off her blood thinning regimen, due to the present circumstances. To avoid scaring her mother, she went into the hallway, grabbed the nearest nurse, and explained that she needed a CT scan and a heparin drip. The medical team did not believe her, checking her legs for clots and finding nothing. It was only when they gave her the scan she initially demanded that they found the blood clots in her lungs. Her trial wasn’t over. Coughing from the pulmonary embolism was so severe that she reopened her surgical incision. Back in the OR, doctors discovered a large hematoma in her abdomen, a bleed, an unwanted effect of being on blood thinners post-op. Serena then had a filter inserted into a vein to trap the clots trying to reach her lungs. She was bedridden for six weeks. That was September. And yet there she is, just three and a half months removed from her bed, stepping onto the court in preparation for her postpartum debut at the Fed Cup. This somehow feels more precious than it would had I been seeing Serena in her glorious prime. It feels miraculous. But this is no miracle; this is discipline. Watching Serena practice, I think of the years and years of work that have delivered her to this moment. I can never know what it’s taken to get here, what it feels like in her body. I can only sit in awe of her. I am moved by the sight of her labor, transfixed by the sheets of muscles that wrap her bones, the way her limbs move around her core as if they were being pulled towards it, as if the sheer density of her strength is all that holds her cells together. Her motion is explosive and tight. She hits tennis balls like they have personally offended her, and stands grounded in her power. How she is able to move like that after such a traumatic introduction to motherhood is beyond me. Seeing her move is revelatory. 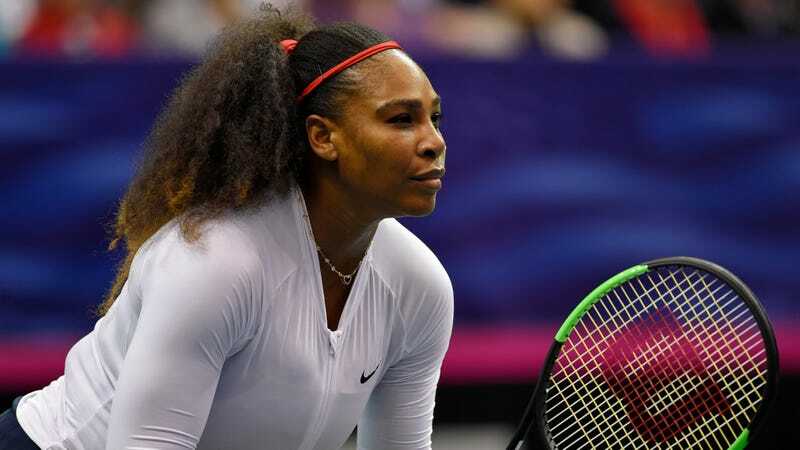 As Serena Williams practices against her sister, it feels like being privy to a secret, the intimacy of a lifetime playing together unspooling onto the court as the two women grunt and perspire. They smile easy, wide smiles. They joke. It all looks very serious, but also, it doesn’t. Serena makes a strangled, open-mouth wail as she stretches hard for the ball and comes up short. I am suddenly filled with an uneasy awareness of my own C-section scar. Serena swats the ball in fast, hard chops. Serena serves and serves and serves again, the grace of her fingers as they release the ball skyward imparting a sense of delirious calm before the explosion. Serena bounces on her spring-loaded legs and hit a ball so hard I break out in goosebumps. I think of what it was like, having my abdominal wall cut apart, and I can barely believe what I am seeing: Serena, racket in hand, clawing her way back into the hard-won rhythms of her body. A friend of mine is working as a driver for the film crew that has been following Serena for months. She tells me that the crew gets bored with Serena’s six-hour practices. Later that weekend, the crowd behind me will make snarky comments about her weight, and it will take all of my restraint not to turn around and unleash an unmitigated fury. Watching Serena sweat and work and pant and dominate and fumble and sweat and sweat and sweat was as inspiring as anything I’ve seen. It felt like what I imagine church is supposed to feel like.